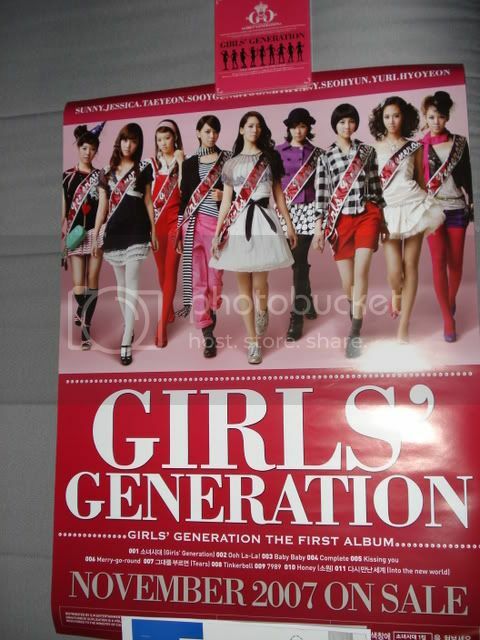 I got it, I guess their shelving SNSD for now as a name, I got the new CD and poster! ^Good quality video/audio. Soo Young, Jessica, and Yoon A look really good in their outfits. It was cute when Soo Young and Tiffany kissed Hyo Yeon. I also put up some scans of the album booklet. I want the poster! There's a YT link of their new MV in the first post, too. I like the group segments of them in the red and white sweaters grooving to the music. It gets kind of seizure-inducing near the end with all the cuts to the different scenes, though. Still, a great MV. I've listened to most of the songs from their album. I'm not feeling it yet but I'll probably like it more after I listen to it a couple more times. Wow, I want the poster! Can't wait to have my CD~ I hope YA pust the poster for order soon, because I want it! I like the album, it's nice for a debut album. And both performances, from Mnet & Love Share are great! I like the dance and the song, it's catchy. Am I the only one who's confused between Yoon A and Yuri? It's not very hard to tell them apart in stills, but in vids, I'm like "Who are you? @_@". I spent my night going through their thread in some forum and now I can match some names to faces! I rule so much. Could someone tell me what concert is this pic from and how recent is it? TIA. I like this group, I've probably played the Girls Generation MV repeatedly in the last few days. My favorite member is SooYoung. She's so pretty, she almost doesn't look Korean. But she's already accomplished alot in the entertainment business, debuting in Japan at 11 in the now defunct jpop duo Route0 (so she can speak some Japanese). Plus she lists Morning Musume as one of her favorite artists, so this girl is win. That's exactly what Yuri said in this video http://www.veoh.com/videos/v1369664PBAFcBrk But I can tell them apart because I already recognize YoonA from DBSK, SuJu, and CSJH's videos, and Yuri looks like one of my friends. But I guess that doesn't help you much to remember them. In the beginning, I didn't think Yoon A was that pretty and thought she was the front girl only because she was the most well-known before they debuted. Now, I think she's pretty cute. She's stunning in that tiny photo on the second page of the album booklet. She looks good in the above photo, too. I'm glad the front girl doesn't necessarily have all the lines in the song. The lines are far from evenly distributed, but everyone has at least one solo line. Yay! SooYoung was the first one I remembered because she didn't look Korean. I like her too. She seems cool. Now that I know most of their names and faces , I developed favourites! My favs are YoonA, Yuri and TaeYeon. my fav is sooyoung then Tiffany, YoonA, Jessica and HyoYeon~ But I love all of them~ they're so pretty and talented! Tiffany has the cutest, "I'm Sorry" or confused look! She is up there, with Taeyon, SeoHyun, YoonA for me. But yeah, I like them all! Tama-chan got me interested in this group!! Have they sung Girls' Generation live anywhere yet? I'm trying to look for it but haven't found any. The third perf is live! ^^ Sounds weird around the 2:00 but that's just Lee Seung Chul and his weird singing lol but it was a nice performance! Thanks, Pinkosa. I just saw the file on some forum and is trying to dl it.